The Brisbane Valley Rail Trail 24-hour E2E Ultra Extreme Challenge Ride will be run along the full length of the BVRT later this month. The end-to-end cycling event, being organised by the Brisbane Valley Rail Trail Users Association, will begin on Friday, August 24, at 10:00pm in Esk and will run all night and the following day. It has been billed as Australia’s toughest 24-hour rail trail ultra endurance cycling event. Cyclists will ride from Esk to Wulkuraka Station in Ipswich, then turn around and ride the full length of the BVRT to Yarraman, then turn around and ride back to Esk. The event will be the first BVRT Ultra Extreme 322km bike race on the fully completed rail trail, including the new section from Toogoolawah to Moore. First prize is a weekend holiday for two at Wikirri B&B Resort in Blackbutt. Australia’s longest continuous hiking, cycling and horse riding rail trail is now a reality with the official completion of the final stage of the Brisbane Valley Rail Trail. The official opening of the recently completed Toogoolawah-to-Moore section occurred at Harlin on Tuesday with a ribbon-cutting ceremony attended by Opposition Leader and Member for Nanango Deb Frecklington, Somerset Mayor Graeme Lehmann, Assistant Minister for State Development Julianne Gilbert and Federal Minister for Regional Development John McVeigh. Member for Ipswich West Jim Madden said the State Government had contributed $1.8 million towards works to complete this final link of the rail trail. 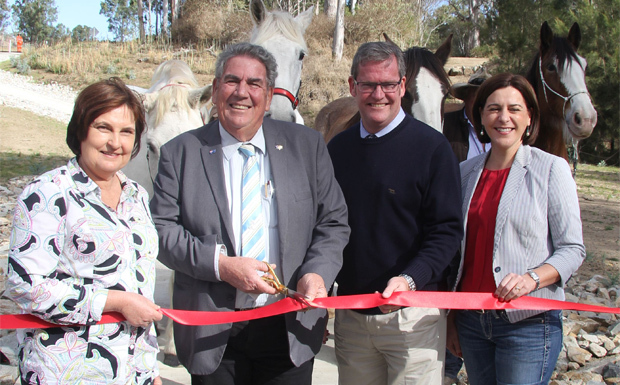 “This completes a long-standing vision for a continuous 161km trail delivering a unique and exciting recreational experience for bushwalkers, cyclists and horse riders,” Mr Madden said. 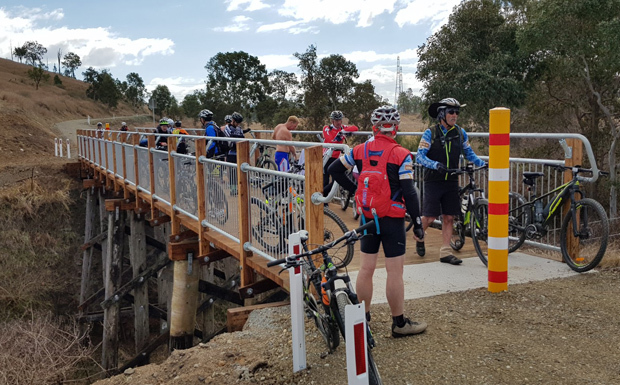 Somerset Mayor Graeme Lehmann said he was proud the trail was now completed and that the economic and tourism benefits for the community would be far reaching. “Council is so proud of its achievements in being able to secure more than $3 million in funding to have this section of the rail trail completed,” he said. “Council thanks both the Queensland Government for its funding of $1.8 million and the Australian Government for its funding of $1.45 million which has helped to make Australia’s longest recreational rail trail a reality. 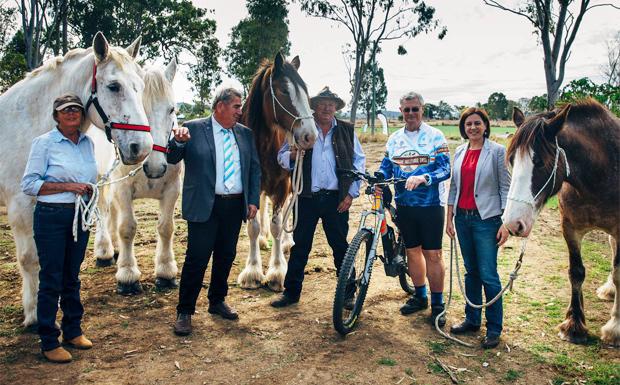 “The Brisbane Valley Rail Trail will be a generator of jobs across the entire 161km linking towns and benefitting business in Wulkuraka, Fernvale, Lowood, Coominya, Esk, Toogoolawah, Harlin, Moore, Linville, Benarkin, Blackbutt and Yarraman. Assistant Minister for State Development Julieanne Gilbert said works on the latest section started in 2017 and included major crossings at Ivory Creek, Emu Creek and Wallaby Creek and several road crossings across the D’Aguilar Highway and the Brisbane Valley Highway. “Further works included various minor road and creek crossings, refurbishment of Jimmy Gully Bridge, grids, gates and signs,” she said. Transport Minister Mark Bailey said the government was committed to further develop other sections of the rail trail to ensure it was a world-class tourism asset and major drawcard for national and international visitors to the region. Fabulous. Looking forward to travelling up from Sydney soon to ride it.